Ross started with a story. In 2012, his company won a global airline client, they had a brand new domain so thought would bolster that with having links too. Building this up. This retainer was £50 k a month, a huge amount in Ross’ eyes. Once they had the client, they started with a strategy session. Ross was asking if he could spend this much on link building. Instead they had an Ideation Session It is ideas generated by subjective opinions (creative director). There were some good ideas others not. All the biggest minds in the agency were in this ideation session. We finally settled on the concept which was an infographic, but it was phenomenal. Pitched this to the client. Then went to make it. How many links were generated? Got 0 links. Not objective. Just people’s opinions. There were no frameworks. Ideation through the lens of the people in the room. Also no concept of flop risk. So they went back to the drawing board and as a result Ross’ company came up with their own methodology. Angles – how many angles and stories can you get from this. RAP sheet – finding all the links and data pulling in. 3 angles, 3 headlines, mean 9 pitches. Go to FB to get audience insights. Investment Banking for example. They love money and a cheeky nandos. You would not think an investment banker would like nandos. They also like JD Sports. They also like wales. Once done this, can write on a whitboard, this person is, this person is not. Make assumptive statements. This person likes watching Dad’s army, they are more traditional. Then put this into the ideation framework. Identity – piece of content expresses who I am than I can. Eg if you are left handed your more likely to be a genius. Utility – making something useful for people. What does 2000 calories look like in fast food. Or 7 alcoholic drinks and bad for you ? Breaks a pre conceived bias. Eg Londoners are miserable. The content finds the audience which is the opposite way you do things. Sarah Bradley is Head of Student Engagement at Oxford Uni. Sarah started by clarifying the definition of baby boomers, Generation Y, Millennials and Boomerangers. Baby boomers are born between 1946 and 1965. Then Gen Y is those born from 1965 to 1979 and Millennials are born between 1980 – 1994. Millennials are boomerangers,they have a low trust in businesses. They have a fragmented culture and rely on tech loads. Generation Z are born between 1995 and 2013. Millennials have micro interactions, love snap chat and instagram videos. Business interaction needs to be more personal. Earned beats owned. Put this photo in. What is a student? 18 years old, in full time degree. Uni students 21 to 30 plus makes 59% of the population. Part time is most popular way to study. Not 3 years full time. Students make up all these demographics. They do not all drink alcohol. They are savvy. You need to have tangible ideas. You need to have idea how to interact with partners and stakeholders. Local colleges, they are thought leaders. Look at local communities, we can talk about social innovation. They are interested in social and innovation. They join societies, they are interested positive mental health, gender, change focused. They are about health too. Get to know us, they say. Do this through community management. Spreadsheet, search for conversations what they are talking about and interact with them. Students are in a constant circle through their uni. Eg take exams, enrol, students interested in sports Wednesday afternoons. Why do students go to uni? It is not because of what their friends are doing. So when doing a timeline, you have some key dates on UCAS. 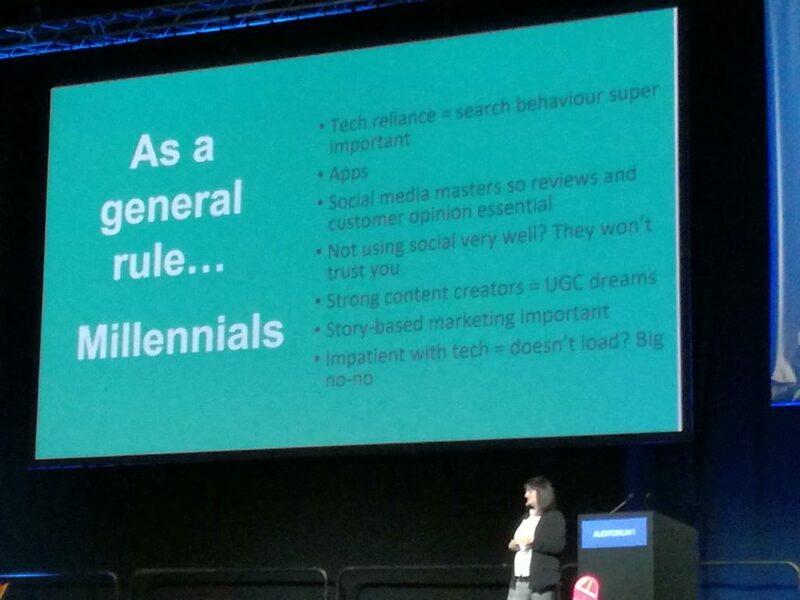 Put this into your standard annual content planner and combined with your community manager, can build on this. When look at this, money is the biggest attitude. It is important to note that students get their maintenance grant in October. So keep deals until October. Many students do not have disposable income. They pay £9,250 min per year. But they want to go to uni to change the world. So how do you engage with them? Engage in the things they are interested in. Give them opportunities to influence your content. Reteweet, ask for opinions, celebrate diversity. Student take overs is a great way to do this. Bobbi Brant started off by saying that 78% of online audiences are already watching Facebook Live content and 81% watched more live videos in 2016 than 2015. Bobbi then went through the ways of how you can use live video. Buzzfeed has been using live video. They did an experiment, how many rubber bands can you fit around a watermelon before it explodes. It was fourty five minutes. And got over 800 000 views. Benefit use live video. They, did a series called Tipsy Tricks. They give wine and give make up tutorials. The videos show how easy their products are to use. It gives a behind the scenes feeling. So Kaizen did a live video and here are the results. They had to decide what platform to use. One best to use what makes most sense for you and your brand. It was hard to do the live video. Walking round the office, asking people questions. Max 20 views whilst live. But then it was only 2.5 minutes long. 25% higher impressions than average tweet, also have 16% click through rate. 375% higher engagements than the average tweet. They were not totally happy with the results so they did a second live video. There were 106 views in 24 hours, but 38% higher impressions than average tweet. And 1050% higher engagement than average tweet. But think of this for larger brands. You can see the impact that live video can have. What did we learn from live video? Anyone can do this. It is cheap too. You want to make it part of your strategy. Video quality is important so get a camera and tripod. It is good at amplifying other content. People would rather watch live video than read a blog. What could you live video be? Bobbi shared what they could be about. Eg product launches, like Apple and iPhone7 they live streamed through the world. Apple make people feel part of the event even if they are not there. Use live video to launch a link building campaign. Conversing with your audience. Direct two way conversation. Don’t be too scripted. Be prepared though. So bullet points etc. Don’t set times, set sections. 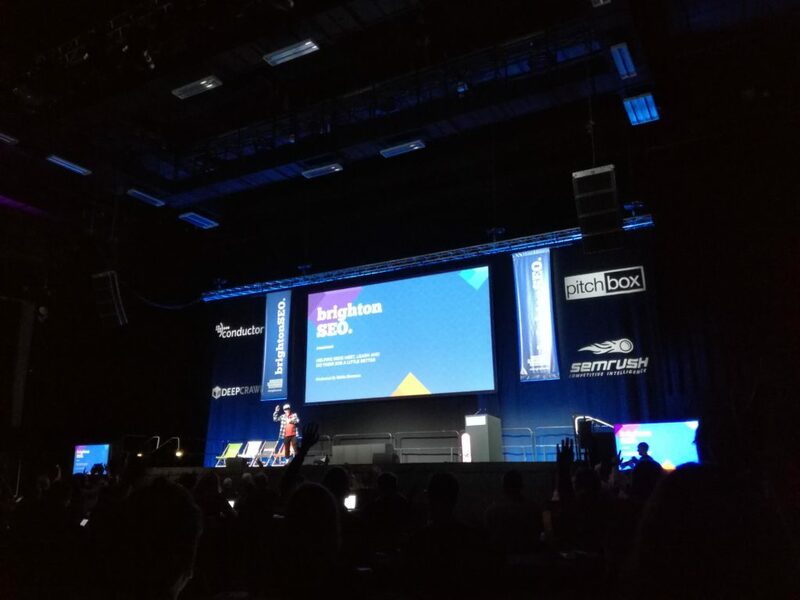 Great talk from Bobbi, the presentation is on the Kaizen blog. Matt Siltala does a lot of photography so loves all things visual. Do you feel like your social media shares are going nowhere? You have this asset, how are the different ways you can use it? There are different areas that can be used for social media. Or you can use it for different banners. While creating the infographic, think of the ways it can be used and repurposed. Once the infographic is approved, then design it. Then deliver it in 3 social media seizes for FB, Linkedin and Twitter. Then Matt went through a case study. His team worked with a group that removes varicose veins. Worked on an infographic. Had 100s and thousands of links. Went so well that took little snippets from it and the comments from people too. And worked out the biggest areas that needed to be visualised then shared on pinterest and instagram. Recurring topics – if have some sort of editorial calendar, could be as simple as an excel spreadsheet. Every time there is a holiday, Matt’s company puts something funny out. Foodtruck Friday, there is a reason to follow them. Once topic is established can use them again. This is going to help brands foresee trends and be prepared. Matt talked about Blendtec (will it blend)? On the go type blender. All eight hundred units sold out within fourty eight hours. 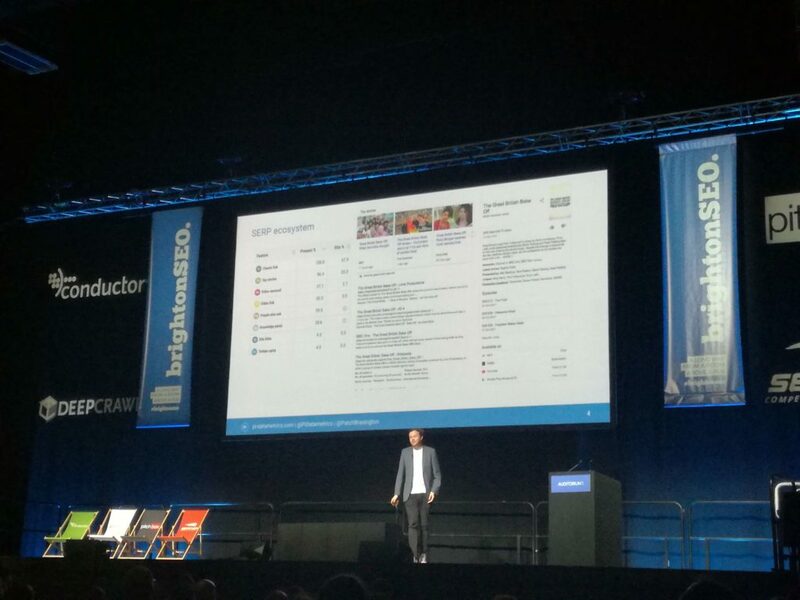 John Brasington from Pi Datametrics shared a process/methodology to help deal with different pools of content.Put search data at the code of your digital strategy. We are starting to have news carousels, info about the Bake off. Rapid tracking, pi datametrics can see the tracking over a day. 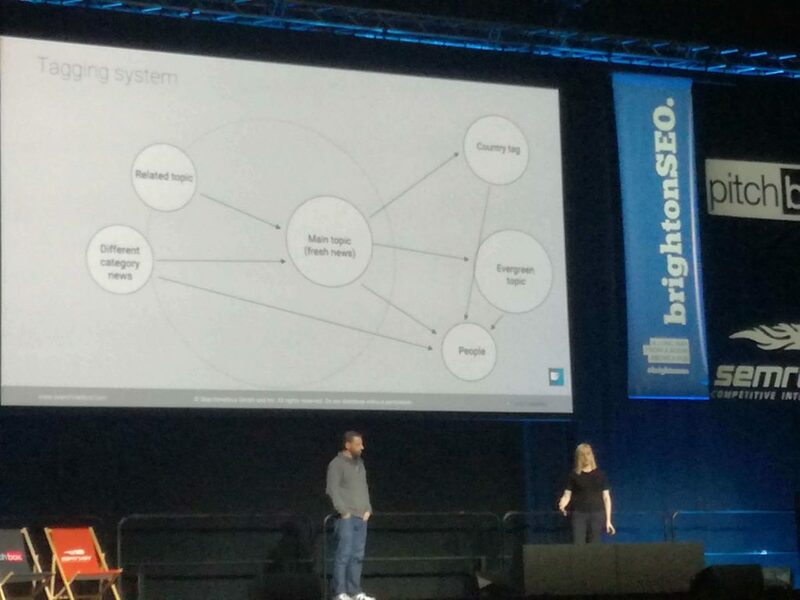 The SERP ecosystem it changes. Traditional approaches alone are no longer working. It will not take you where you need to be. Keywords and positions are still important but ecosystems are everything. What do we mean by Contextual Optimisation? Before you create and publish new content, stop and think – how will what I am creating impact on my eco system? The eco system is your brand. Categories your ecosystem – what on my website, could conflict with it? Eg both pages ranking same result or what is supportive? So how do we find complimentary and conflicting content? Then do Site: cnn.com “Mueller case” less results. Can see this easier. Look at the page titles. Then try and detheme too. Look at appropriate linking from complementary pages. Meg Fenn founder of @Shakeitcreative, a Design and Marketing agency in Sussex. Graphic design is the creative spirit of your website. Takes 15 milliseconds if people like your site. How do we bridge the gap between design and SEO so we can have smoother projects and better websites? Design contributes to how well a website is liked and how long people stay on it. UI is part of UX. UX encompasses emotions and responses. It is these responses that create an action. 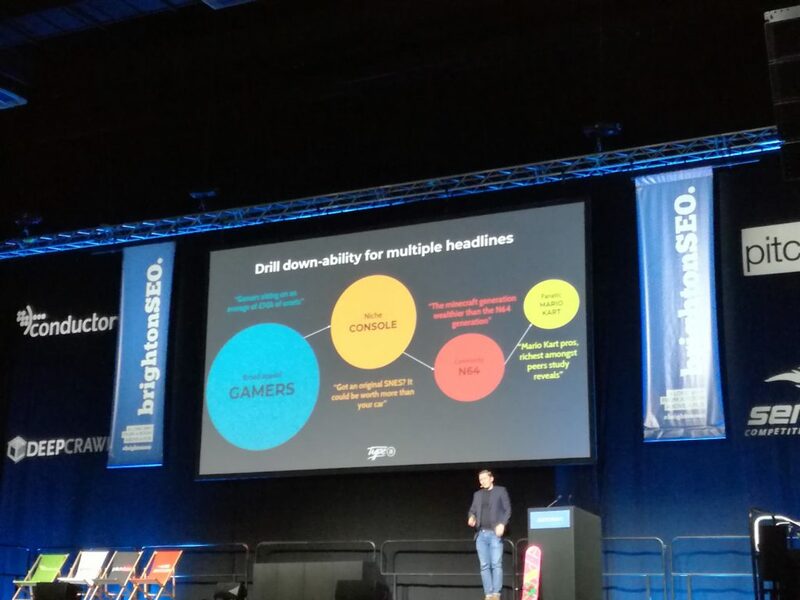 SEO says we need to optimize for humans. But humans like engaging with other humans. UX means better experience, engage longer, buy and share. 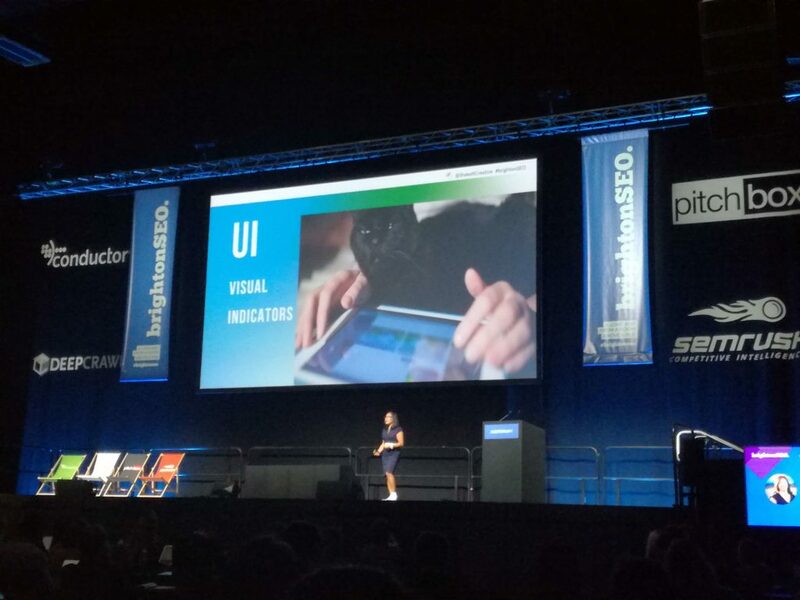 UX influences, time on site, bounce rate, page speed and mobile experience. Trust is part of UX so must design for UX. 8% of men and 0.5% of women suffer from some kind of color blindness. Images and photos can improve the UX of a website. Use images and photos too. Make sure the images are compressed. Changes in how you think of the site. Before moving from desktop to mobile. It has also been a change for clients. They have asked for mock ups on desktop first. 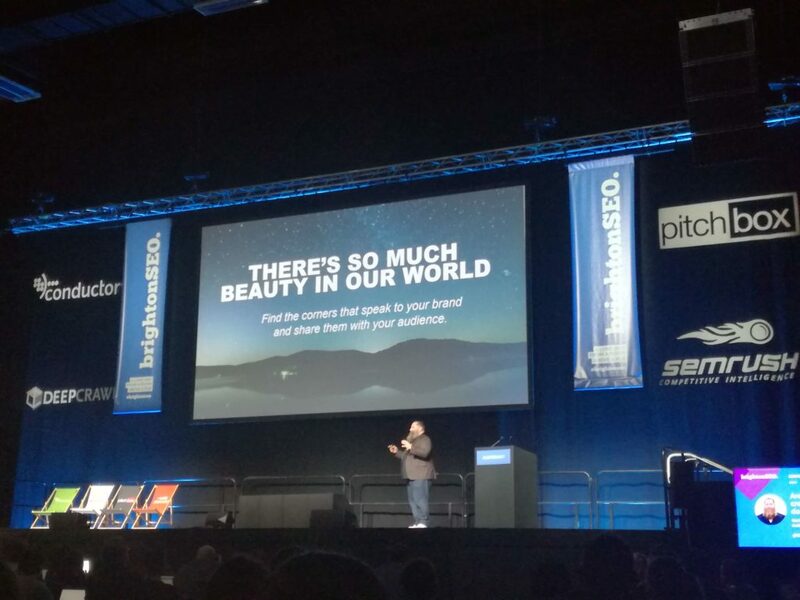 Use stunning design to levate your SEO, do this through UX and UI, Design is an important part of SEO. People should collaborate. Hannah Thorpe, Head of SEO at Found gave an insightful presentation about SEO and where it is heading and how it impacts your brand. What if brand is just a type of keyword? The way your brand is searched for and linked to, it could be a ranking factor. SEO in a few years time will be different. SEO is in its infancy, Google is 20 years old. When Amazon was 19 then it offered the web services. Our standard methods do not work. 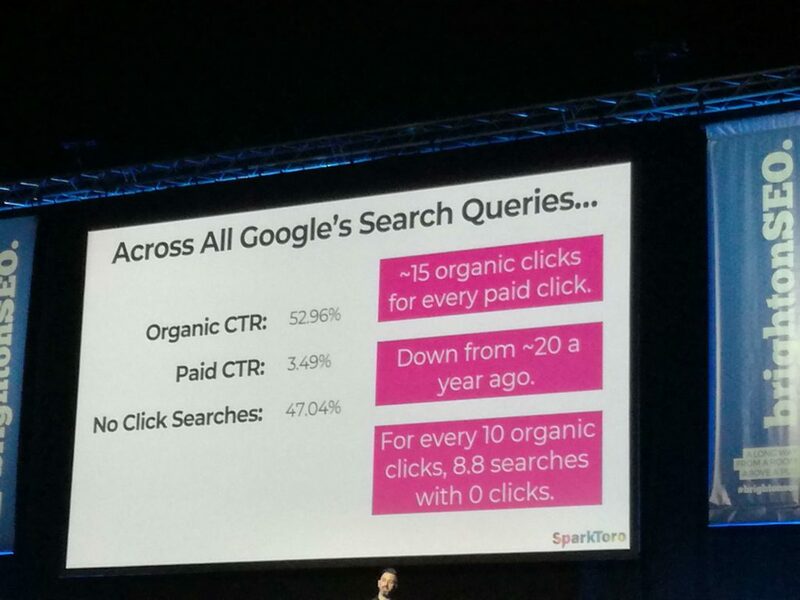 34% of searches result in no click from the SERP so that is a lot of non SEO traffic. There is no such thing as a truly accurate search volume. Verve has a cool tool to get the real search volume. What are our customers doing, what type of information do they need? Make point, expand on it, then comment on it. Keep it simple with tables. Define what is in the table. Either we help Google to understand or we accept that we wont win certain types of results. You will not rank if you are talking rubbish. Google needs evidence that you are the preferred brand. Google changes are customer focused, so we need to be too. Can do this through Search Console. 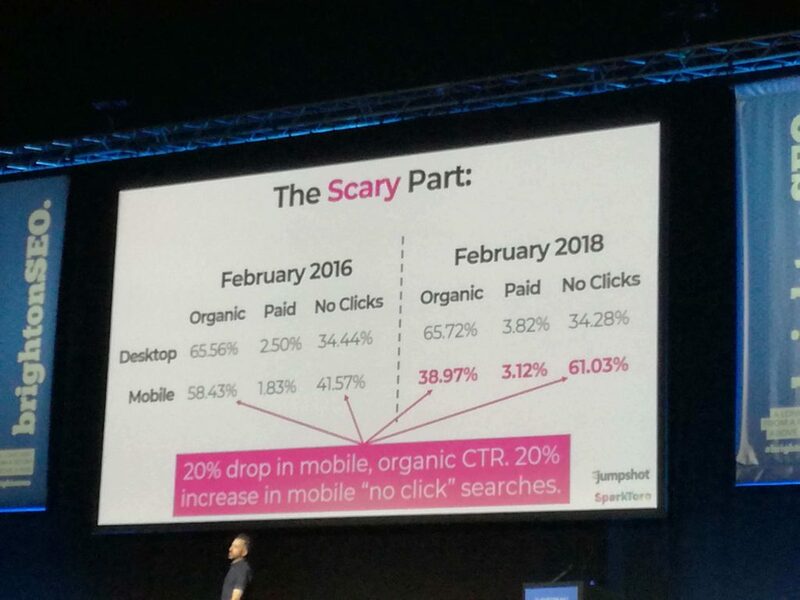 Look at average position vs click through rate. Track your structured data (Little warden will integrate in their toll). Rankings do not equal traffic. We have conversational search, algorithm changes, time in SERP, so we need to change the way we are working. Read more about Hannah’s presentation on the Found blog. 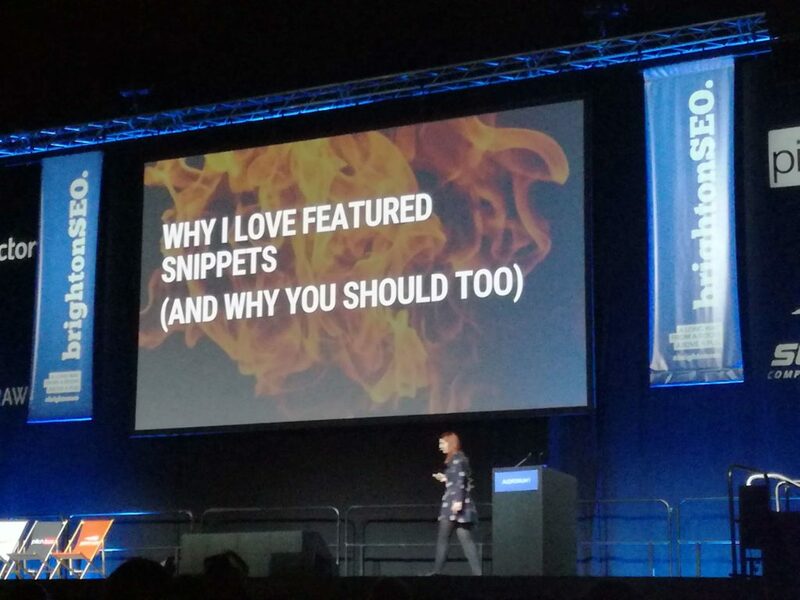 Izzi Smith had some interesting case studies about featured snippets which she shared with the audience. Featured snippets, can help uplift your traffic. There could be many problems. Look at the Answer the public so can see the keywords around a certain topic. 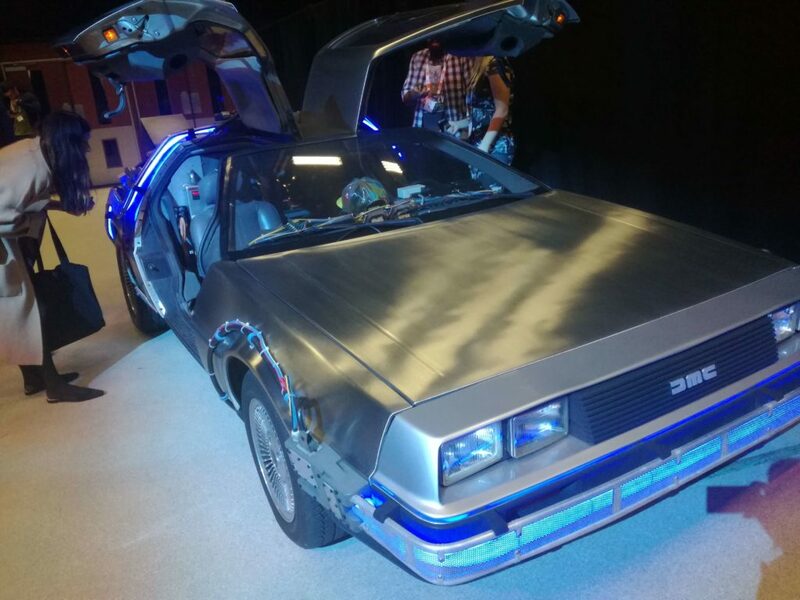 Focus on the terms with high click intent – eg how old do I need to be to hire a car. Now you have all the keywords and the intent, go and build them. Landing pages – holistic or specific? Rich snippet needs to be factual, written for humans, has supporting data and sources. Ignore keyword density please. How to methods, use light html or lists. You want there to be the see more text. For comparisons and data, construct tables. Make the content grabbable by Google. Why do you deserve to be there? (EAT – Expertise, authoritativeness, trustworthiness). So do not just provide your question keyword and answer, put a heading and introduction. Fantastic additional content. Where are you in the snippet queue? Do not lose faith, featured snippet hunting can take a while. Google is continuously perfecting it. Sixt has some successful case studies. Need stars, rating, data. Sixt is not a recipe site. So needed own car rental snippet. Izzi then looked at Wikipedia. She changed the landing page template. Car data and car schema market up. Put some tables in. After 3 months has the featured snippets car model. Taking their organic and putting at the top of the SERPs. The user cannot ignore them. Taking a question and answer format and changing it. Promoting content to its own landing page. Do car rental companies accept debit cards? That was a page they created. Got featured snippets. Overall, the CTR increased so much by having featured snippets. Ensure your content is grabbable. 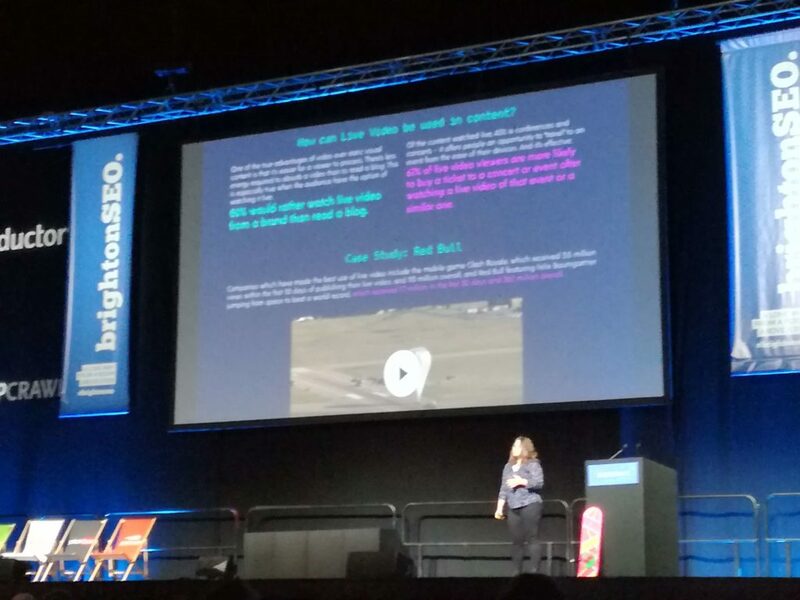 Loved the presentation Izzi, here it is on slideshare. Indexation, Cannibalization, Experimentation, Oh my! 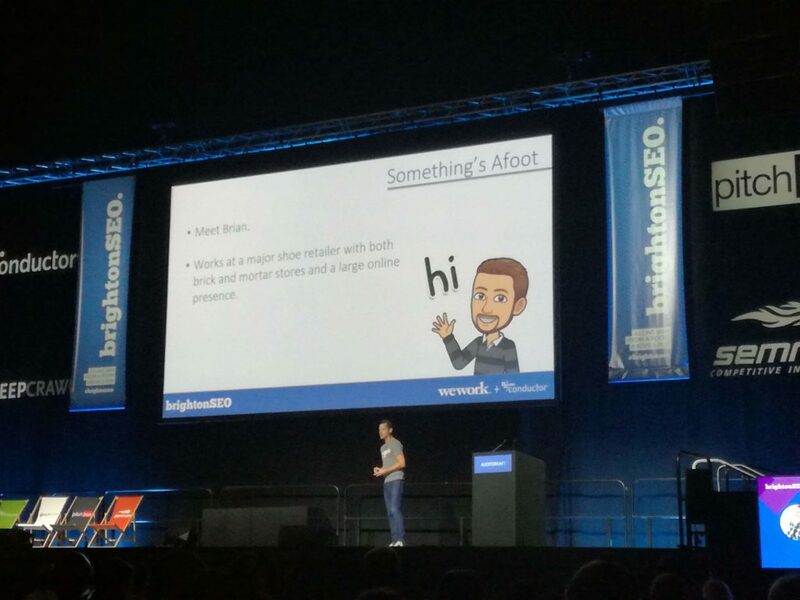 Patrick Reinhart from Conductor, talked about a case study where the client was losing traffic from his ecommerce shoe store and he helped turn this around. There were 45 million urls in the index and the site only has 12 000. So the real problem was this. Massive Index Bloat. Google is sifting through an endless number of parameter pages. Google cannot get to the important pages. Need to answer the question, what is junk and what is not? Search engines could not get to those real pages. The client said lets just block everything. BUT this is risky. Most people would say let us implement canonical tags, but they had a messy back end so could not do this. So went to the robots file and blocked it all there. And what happened? Traffic increased so much – insert here the photo. Just by modifying what appeared in the index, they got so much traffic. Small technical changes can have a big impact. If you have 45 million urls indexed but only have 12k pages on your site, something is wrong. Use your robots file to block and de index pages. Large e-commerce site, sells cables. The site was slow growing in traffic and revenue. He could not understand why. There is a different page for every single size and color for each cable. That is way too much. So Pat looked at the cannabilisation. Could show that all the pages were competing with one another. That was the problem. So updated product template to combine the color and size pages using dorp downs. Redirect all the color and size pages to main product pages. But client did not want this. SO met in the middle. Slowly but surely nice growth 15% YoY ! Do what is right for the clients. Stop doing things you always do and do it differently. Think how to do things automatically ! Svetlana Stankovic and Björn Beth spoke about bridging the gap between ranking factors. These sites have large file size, on .com domains. Finance – Moneysavingexpert – rank 1 for cheap personal loans. They serve the content over http2 protocol. In media you know that article pages have more external links but they are only having a short lifespan. 2 days on average. BUT tag pages gaining authority, long lifespan, rank for high search volume queries. Top 6 ranking factors, they have more words (57% more work s than average. Less keywords than in body. Online travel user journey – you want to have four specific moments/types of user journey to give information to your users. When you look at tripadvisor, they give answer to all of these steps. Also they have advanced internal search for all stages of the user journey. They are user centric and not keyword. 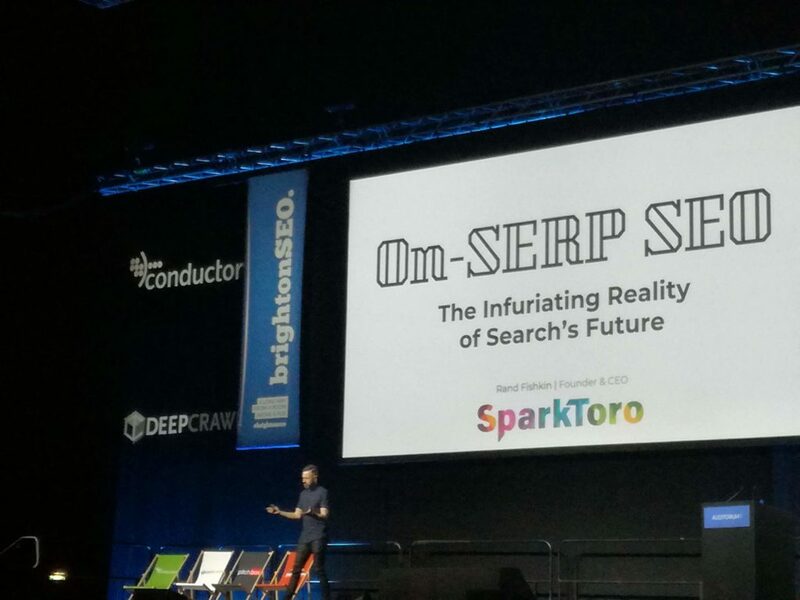 The infuriating Reality of Search’s Future, what a great keynote presentation to end the day of BrightonSEO. Rand started by saying we helped Google, they then get to crawl our sites for free, scrape our content without trademark infringement. Then we got clicks. Rand did not believe the Google’s Free Traffic. Founder of SEOBook knew what Google was doing with all these changes they were doing to the algorithm. He thought about the Trojan Horse. With 3 to 4 serious competitor, Google could not afford to piss off content creators. There was Yahoo, MSN, Ask Jeeves. Google had to play nice then. But once Google had 90 percent market share, then this all changed. Where are these changes happening? More on mobile than desktop. More on popular queries than long tail. Do not see it as much in informational. Now get Google maps listing when search for a restaurant. Have to go to maps before then go to see the website. Weather the CTR has dropped to under 30 percent. Flights – this is now appearing Google flight box above the airline’s own page. Sports same story – why are the major sports franchises participating in this program? Hotels – Google is doing this as well. And Famous and Notable people. Google is now also extracting information that an author wrote. NLP teach used to extract these snippets. Also Google jobs and Concerts and Events. Google wants to go back in time and be AOL. Like 1996. And it is not just true of Google. Facebook too – Instagram has always prevented outlinking. Twitter and Linkedin now bias to on-site content. Reddit wants to keep you on Reddit. You Tube cuts off descriptions to avoid making links visible in the default view. It has never been important to make your website (and email list) the center of your campaigns. So we need to own our properties as best as we we can. Leverage every scrap of traffic Google (and others ) still send. Shift content marketing to KWS Google is less likely to Cannibalise. Build up demand for interactive content. Instead of saying my number one goal is to rank for the keywords, make it my brand appears more than the terms. Invest in organic now as more traffic goes paid only or Google only. Invest in the future in On-Serp SEO. It is breaking the deal. if Google is biasing to Youtube, images, G News, Maps etc, create content for those platforms. Organic Marketing Opportunities will always exist and they will always give outsized benefits. SEO will be a crucial skill set for at least 10 more years or more. Especially in emerging markets and long term words. The harder a tactic become, the more of a competitive advantage it has.